Hot summer, many prefer to spend time on the beach, soak up the sun and swimming in the cool river. However, sunbathing all day can be quite boring. Make sure in advance about how to entertain themselves with games. The traditional summer game is beach volley. The company will split into two teams and throw the ball over the net. Your team must ground the ball in the opponent's half and not to let him fall on his own. The game can go to any number of points, the players agree in advance, or as long as it does not bother the participants. Play on the beach. The deck is easy to carry in a small pocket. If you are tired of "stupid" and "fool springboard", play "STO", "Sekou", "pen", "drunkard", "believe it or not". With maps you can also play in "Mafia". To do this, select a presenter, who will deal the cards according to the number of participants in the game. The deck should be ACE – mafia, king is the Sheriff and six civilians. You may want to dilute the company doctor, the courtesan and the other characters, which will come up with the players. The objective of the mafia is to kill all the inhabitants and not to get caught by the authorities. The task of the Sheriff is to find the mafia. Play familiar to many from childhood game of "Forfeits". To do this, write paper tasks, add to someone else's and give Panama the lead. He will pull the notes and not reading them, say, who gets this penalty. Pre-agree on the framework, otherwise it may happen that someone will have to run naked on the beach. Frisbee is a game with a flying saucer. Throw it to each other, trying to catch himself and not give it to someone. And to throw a disc like you can on the beach and in the water. Well, if one of your friends took the dog with them – your game will be enriched not only two-legged but four-legged players. The least popular game for hanging out on the beach is badminton. He can play as a couple, or a couple for a couple. You do not need special skills for this game. Half an hour of training, and you will be able to successfully make a racket against the fellow. Camping is good that is not dependent on the time of year. To sit equally well in both summer and winter. If you are going on a picnic, consider in advance how you are going to have fun and what to play. Then the camping trip will be much more fun, and waiting for the barbecue is not so long. Most popular summer game is football, volleyball and dodgeball. In addition to the health benefits and shape, plus these games that only need one ball that will easily fit in the trunk. If there is a reservoir, and weather permitting, you can play water volleyball. Positive emotions are guaranteed. Relaxing Spa badminton. Two rackets and a shuttlecock will take up even less space. Besides, do not look for a large flat area for games. If you pre-buy a Twister, you can combine a session of laughter with the training in yoga. What are the only figures not derived from the twisted bodies. Tired of the standard game? Select one of the active person, it will be a mammoth. All the rest are hunters. Their goal is to drive the poor animal into the network, which can easily replace a veil. Noisy and fun game "Lined up": the presenter selects a topic for which all participants need to line up, it could be height, weight, first letter of the name etc. have Risen the last is the loser and is eliminated. When the force does not remain to play the traditional game "Crocodile". The presenter thinks of a word or phrase, and the participants need to explain it to everyone else, not saying a word. Popular game "Mafia" is quite suitable for the summer picnic. The larger the company the more fun to play, inventing new roles. For example, the physician who can cure one player, or a temptress, which will damage the other. If in the summer you can afford a little lazy, playing, sitting on a large blanket, for the winter holidays you should pick up outdoor games. Otherwise you run the risk of freezing. The easiest option is to play in the snow. Can be split into two teams or play every man for himself, and you can build two fortresses and as a child to arrange the defeat of the enemy. Play horse. 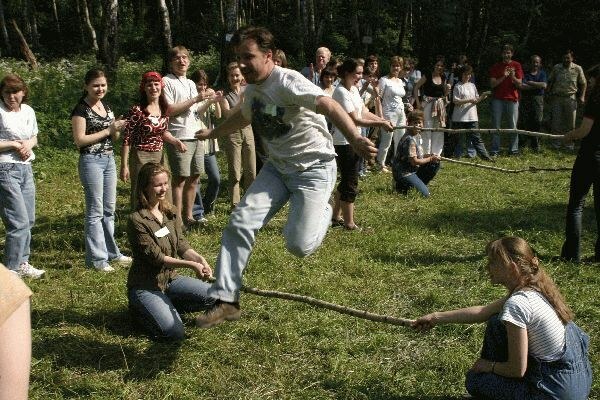 A few people lean forward, clasping the hands of a neighbor in front and the other participants a run needs to jump on this "horse" at a time. Plus this game in the winter is that in case of a fall no one will not suffer much, the snow will soften the blow. The same game can be a little change, if some people will sit on the shoulders of others. The goal is to throw each other and win the most persistent and strong. Going to nature, take with you and children. They will gladly play with you, adding fun. Stay in the circle of close friends is almost destined for success! You only have to come up with fun games and contests to planned evening certainly exceeded expectations your friends. "Pantomime" is a favorite game of mental companies. The person thinks of a word, says it in the ear of another. The player's task to show this noun using gestures. The game goes to a new level, if you try to make a complex image for words such as: abbreviation, enthusiasm, loyalty, eternity, phenomena and so on. The game "Who are you". Each player writes on a small sheet noun, then this sheet is pasted on the forehead to the neighbor on the right. People must not know what is written on his forehead, his task is to guess the word with simple questions that can be answered only "Yes" or "No". For example, a person on the forehead a piece of paper with the word tiger, he asks "is This a plant? ", other players say, "No!". This is followed by a turn to another player and so on. The transition speed is carried out only when the answer to the question was negative. An interesting game of "Principle". One man stepped aside to listen to other counsel. He is the water. The remaining make the principle for whom they will answer questions, for example, for the neighbor on the right. Water returns and starts to ask simple questions all in order and they must answer, according to the hidden principle. For example, water you asking: "are You blonde? ", and you, even if you are the owner of blond hair, but your neighbor to the right, the brunette, replied: "No!". The task of driving to guess the principle itself. It can be completely different, for example: everyone is responsible for themselves or for the closest person who has the piercing, the water, and so forth. Water needs to ask such questions, the answers to which are obvious to all. You can still play in the famous "Mafia". Competition "Storytellers". Two teams of three people total in each team there is a narrator, a talking head and gesticulator. The narrator stands to the side and tells an interesting tale. The player, playing as a talking head, sits down on a stump and cleans your hands behind your back. His task is to open your mouth as if it he tells the tale (it is not necessary to forget about emotions and facial expressions). Gesticulator to sit in the back of a talking head, hiding its head. It needs to gesticulate what is narrated in a fairy tale. Teams show and tell their tales, and those who did not participate in the contest and choose a winning team. This is a very funny and exciting competition. "Captain." Two players tie the eye is ships. Each of them on the captain. All other players are distributed in space and freeze in any position is icebergs. Captains must conduct their ships to a certain installation point. The captain could not touch the ship. He needs to give him a verbal command, for example: "Two steps forward", "squat down", "Three steps to the side and so on. The winner is the team, faster than the ship reached the set point and not touched the icebergs. The icebergs are not allowed to move. The contest is "Colored volleyball". You need to inflate a lot of balloons. The territory is divided into two equal parts. Must be two teams with an equal number of people. Task: to clear its territory from the balls, casting their opponents. At the end of this contest you can divide the remaining balls equally between the teams and hold a competition "Sapper" - whose team faster burst balloons.